Dr. Miyamoto attended the University of California at Irvine achieving a BS in Biology Honors in 1981. He then went to Washington University School of Dentistry achieving the DMD highest dental board score; part two OKU Honorary Achievement Society. 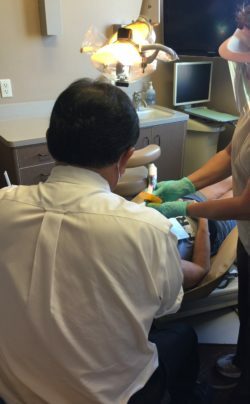 After, Dr. Miyamoto received Certificates in Hospital Dentistry and Anesthesiology at the University of Illinois and West Side VA Hospitals General Practice Residency. In 1988, Dr. Miyamoto received an MS in Craniofacial Biology and Orthodontics at the Washington University School of Dentistry, Orthodontic Department. Dr. Miyamoto donates his time and training to treating craniofacial patients in Los Angeles. He is affiliated with the County USC Hospital and Harbor UCLA Hospital in treating craniofacial patients for over 20 years. His objective is to treat all patients to the best of his ability using the most appropriate modalities and techniques, while working in conjunction with other related health professionals. His orthodontic expertise and skill set is based on over twenty-six years of didactic and practical experience. Dr. Miyamoto has twin boys named Blake and Chad. In his free time he enjoys water sports, golf, photography, gardening, and traveling. He loves spending time with his children. Temecula has been his home for almost 25 years.